Multiple sclerosis, or MS, can be a devastating and progressive disease. While some people may only experience mild symptoms, others will suffer pain and immobility. Unfortunately we don’t yet know what causes this disease or how to cure it. There are medications to treat it, but they don’t work for everyone and they may produce side effects. If you have MS, consider how your diet may affect your symptoms and the course of your disease and think about making some positive changes that could help you feel better. Multiple sclerosis is an autoimmune disorder of the central nervous system, which is made up of the brain and spinal cord. An autoimmune disorder occurs when the immune system attacks a certain part of the body. In MS, the immune system attacks myelin, the protective material that covers nerve cells. This results in damage to the nerves and a disruption to the normal communication that occurs between the brain, spinal cord, and the rest of the body. There is no known cure for MS, and the causes are also unknown. There are known risk factors, though, and these include being female, having a family history of MS, having an infection, like the Epstein-Barr virus, being of Northern European descent, being a smoker, and having other autoimmune disorders. Because there is no cure for MS treatments focus on relieving symptoms, helping patients recover more quickly after attacks, and slowing the progression of the condition. Medications that treat symptoms and attacks include corticosteroids, which reduce inflammation in damaged nerves. Plasma exchange, in which plasma from the blood is removed, mixed with protein and put back in the body, can also help. There are also several medications in use that slow the progression of MS. These mostly target the immune system. While effective for many people in slowing the disease, these medications also leave people vulnerable to other illnesses because they suppress the activity of the immune system. They also may produce uncomfortable side effects. Alternative medications include muscle relaxants, drugs that treat fatigue, and medications that treat the complications of MS. Other alternatives include physical therapy, cannabis, acupuncture, meditation, yoga and exercise, relaxation, supplements and diet. If you read up on MS and diet, you will find plenty of people touting specialized diets to help treat MS. The problem with this is that there is very little real evidence to show that any of them make a significant difference to patients with the disease. Some of the diets that people claim will reduce the severity of, or even cure MS, include the paleo diet, a gluten-free diet, the Swank diet, and the Mediterranean diet. While none of these can be clinically shown to have any effect on MS, research does show that eating an all-around healthy diet and maintaining a healthy weight can help. Specifically, obesity and high salt intake have been found to be possible risk factors for MS. Of all the specialty diets, the one that is most healthful in general is Mediterranean. It includes lots of vegetables, beans, whole grains, olive oil, and fatty fish. 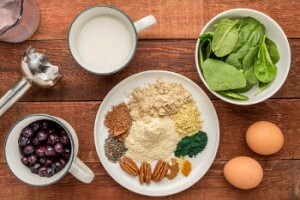 If you have MS, the foods you eat have a big impact on how you feel and how your disease progresses, even if there is no proven specialty diet for MS. Knowing which nutrients support health and promote healing, you can change your diet and use a lot of foods rich in these nutrients in the smoothies you already enjoy every day. Food can be powerful medicine, and while it can’t cure your disease, it can help you manage your symptoms and can have a big impact on your daily life. Omega-3 fatty acids. These healthful fatty acids are known to reduce inflammation, and may help reduce symptoms of MS for that reason. You can get these fatty acids from fatty fish like tuna and salmon, or from plant sources like flax seeds, chia seeds, walnuts, and pumpkin seeds. Vitamin D. Research has found that patients with MS who take in more vitamin D are less likely to have relapses after a remission. Studies have also shown that too little vitamin D may be a risk factor for MS. You can get more vitamin D by being exposed to the sun, but you can also find it in fortified foods and supplements. Vitamin A. Vitamin A may also help reduce symptoms of MS, but it is possible to overdose on this nutrient so be careful if you try a supplement. A better way to get vitamin A is through nutritious, orange foods like carrots, squash, and sweet potatoes and dark leafy greens and fish liver. Also known as vitamin H, biotin actually belongs to the B family of vitamins. Early research shows it may have some promise in helping relieve symptoms of MS with no adverse effects. You will find biotin in avocados, peanuts, almonds, walnuts, sweet potatoes, berries, and eggs. These are a double-edged sword for people with MS. On the one hand, there is some evidence that antioxidants can prevent some of the nerve damage, but they also boost the immune system, which worsens the disease. A good way to balance the good with the bad is to avoid antioxidant supplements, but to eat more foods rich in these nutrients. Choose any brightly-colored fruit or vegetables to get a safe amount of antioxidants. On the flip side, you can avoid foods that promote inflammation while you add in more anti-inflammatory foods. Avoid processed meats and other foods, packaged foods, fried foods, refined carbohydrates like white bread, pasta, and rice, sugary foods and drinks, and salty foods. Ginkgo biloba. The medicinal uses of this tree have been known for thousands of years in China, including mental and cognitive improvements. Gingko may also improve fatigue and decrease the activity of the immune system, both of which may benefit someone with MS.
St. John’s Wort. This herb has long been used as a natural antidepressant and has been found to be somewhat effective. For someone with MS, St. John’s Wort may relieve some of the depression that comes with the disease and it seems to be well-tolerated. There are a lot of possible interactions with medications, though, so never take this without talking to your doctor first. Valerian. This root herb is used to promote sleepiness in people who struggle to fall asleep or stay asleep, a common side effect of having MS. Limited studies have shown that people with MS tolerate valerian well and are able to fall asleep more easily after using it. Cannabis. If you live in a state where marijuana is legal for medicinal or recreational use, you might want to consider trying it. Studies have shown that the cannabinoids, the natural active compounds found in the cannabis plant, can relieve MS symptoms. Living with MS can be a challenge. Whether you have only mild symptoms, you experience acute attacks and then go into remission, or you face the progressive form of the disease, what you eat could make a big difference to how you feel. Talk to your doctor before making any changes, but then consider adding some of these foods and supplements to your diet and to your daily smoothies to see if they help reduce symptoms or even slow the progression of your condition. Are you affected by MS? How have you found relief? Please share in the comments below. Fantastic article Ryan. I found out in 2012 that I had a diagnosis of RRMS. Since then I have been relapse free and my health is much better today than it was back then. I attribute a huge portion of that progress to your smoothies, specifically anything with turmeric or ginger. I’ve discovered many amazing foods along the way that dramatically improved my health, well-being and energy. Turmeric is probably my number 1 along with cinnamon and ginger. I don’t believe that MS is incurable but I do believe that the solution is multi-faceted; Diet, rest, exercise, stress reduction, spirituality (understanding the nature of the mind). Your article on sleep is very applicable here also. Keep up the good work and thank you! Thank you for sharing your success, Kieran. Hopefully this will inspire others to make dietary and lifestyle changes to improve their health. Elated to hear my smoothies played a role :) Turmeric, ginger, and other spices are very powerful and healing and not that difficult to incorporate into your diet. You’re welcome. To continued good health! I realy are drained and feeling tired every day, there are days that i feel better i am 70 years young the diabetes only started whan i was about 67. I have diabetes 1 and was thinking of drinking smoothies but need expert advice on this. I will realy appreciate it if you can send me your book on this. All the bad things that you mentioned that the smoothy recepes will help for looks good. Like you mensioned you have to know what incredients to put together to help for someone like me. I thank you for trying to help people like me and thanks to all the people out there for their comments in how the smoothes help them. Thanks again. You’re welcome, Johan. I hope you’re able to find smoothies and other health strategies that boost your energy and get your feeling better. I just added you to my free email newsletter, once you confirm your subscription you’ll get access to my e-book. I was diagnosed with Multiple Sclerosis (MS) in October 2011, at the age of 55. I woke up one morning with numbness in my lower back and legs, I couldn’t feel my feet touching the floor. I saw my doctor and had an MRI to see if I had a disc problem, it was negative and she told me she feared MS. I was sent to a neurologist, had two more MRIs, and was told that night that I have four lesions on my spine MS. I tried every shots available but nothing worked. In 2015, my neurologist and I decided to go with natural treatment and was introduced to Natural Herbal Gardens natural organic MS Herbal formula, i had a total decline of symptoms with this treatment, the numbness, terrible back pains, stiffness, body weakness, double vision, depression and others has subsided. Visit Natural Herbal Gardens official website ww w. naturalherbalgardens. com. This treatment is a breakthrough for all suffering from Multiple sclerosis, i am strong again! Amazing and inspiring testimonial, Ambrosia! Hopefully, others with MS read your comment, try Natural Herbal Gardens natural organic MS Herbal formula, and experience the same success you did. Been diagnosed with multiple sclerosis in 2015, and I was a woman of 50. They put me on Rebif which I took until 2017 and was switched to Copaxone. I had two relapses on Rebif, none so far on Copaxone. I do notice my balance was getting worse, and my memory, as well as erectile dysfunction and spasms’ had no choice to sick for other solution and I was introduce to https://totalcureherbalfou5.wixsite.com/herbal/contact which I purchase the MS herbal formula from the foundation, the herbal supplement has effectively get rid of my multiple sclerosis and reversed all symptoms.